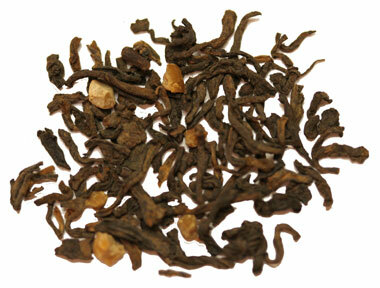 The Scottish caramel pu-erh is a mix of Yunnan pu-erh tea and almond pieces with natural caramel flavors. This is a dessert in a cup. 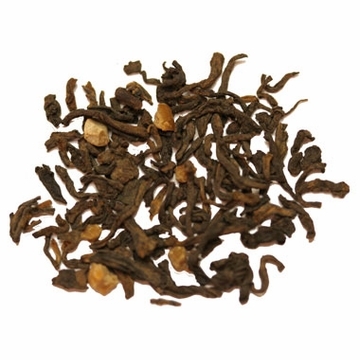 It has earthiness of pu-erh fuses with caramel for a sweetly decadent finish. Free shipping with purchase over $60. • Try our Chinese Tea Sampler. A Great Value! • Try our Value Specialty Tea Sampler. A Great Value! Pour boiling water over and let steep. The tea flavor is largely relegated to the aftertaste. Strong toffee/butterscotch flavor. Perfect as an after supper tea. Deep wine color with normal pu-erth aroma after brewing. Would purchase again. This is like the flavored coffee's except with tea. This is one of my favorites. I've tried other companies blend of Scottish Caramel Toffee Pu-erh & this one is by far the best tasting. My Kids Love This Tea with a scoop of vanilla ice cream added. Y u m m m y ! Wonderful, just the right amount of sweetness, caramel/toffee with a smooth dark tea. Great afternoon pick me up or after dinner treat. Absolutely delicious.. the aroma is very appetizing.. add little milk n sugar, and you have a dessert tea.. Yummy!.. I had purchased this tea locally at a farmers market and my son and I loved it. I found Enjoying Tea and the Scottish Caramel on their site. It is the same wonderful, smooth, aromatic, deep, delicious tea that we had found before. It is almost like dessert. I add sweetener and it helps me stay on my diet. I have also read that Pu-erh tea is an excellent supplement with many benefits. That's great, too, but the taste heaven and Enjoying Tea is much less expensive. Shipment was fast and ordering was very easy. This is an earthy Puerh with a hint of sweetness. The carmel and butter scotch is subtle. Just enough to sweeten it. I am not a fan of caramel or toffee or sweet teas. However, this tea is very subtle and everyone in my family enjoys it with lots of milk, hot or cold. If you're a lover of Pu-erh tea then you have to give this a try. The sweet aroma of Toffee and Caramel will be the first thing you notice about it. The combination adds just the slightest sweetness to the tea without overpowering it or taking away from the tatse of the Pu-erh. This is a great afternoon or after dinner tea. This is a great cup of enjoyment. A bold, distinctive flavor! This is my second order for this and it will most certainly not be the last. When I first opened the package of tea I was disappointed that the dry tea smells like Nestle butterscotch baking chips, which, to me, has a very artificial smell. The tea brews up a rich dark cup with a smooth taste. That artificial butterscotch smell does linger in the cup, however. If you were looking to try puerh tea and have been put off by the earthy taste, this tea might be a good alternative. Aptly named. You can smell the caramel when it's steeping. I used it for a tea party. It was the favorite. I liked it, didn't love it though. This tea is so delicious!!! I enjoy hot tea, as does my oldest son. My youngest son however is not, that is until we found this tea. I add one packet of In the Raw sugar to a 20 oz tea pot and I can't make it fast enough for him. It's not a super sweet tea, but you can for sure drink it without. I enjoy letting it seep until cool and then drinking it, it does not get bitter even then but rather has a lovely nutty flavor. Great, great tea! This tea just came in the mail today (along with a few other teas that I ordered, but I was just dying to try this one). As soon as you open the bag the toffee scent just whips out at you, and the smell is just as prominent in the cup. I would recommend this to anyone. It has a nice, smooth taste. I can't even imagine how good it would taste with milk and sugar. The description says, "butterscotch pieces", but it's not what I expected. I like this tea, it does taste like toffee. I'm not sure which way I like it more; with a little milk or plain. Absolutely love this tea! It's not too sweet, but has such a nice toffee taste that it is great alone or with a piece of chocolate as a nice treat. I drink it almost daily. This tea is a favorite around here with its smooth, rich flavor. I'll be ordering more soon! Tried this first as an iced tea, but it's really best suited for a hot cup of tea on a cold winter day. So rich and flavorful, it tastes positively decadent!